The beginning of the 20th century witnessed a dramatic increase in the number of immigrants coming to America's shores. In the century's first decade over 9 million expectant new arrivals - almost three times the number of the previous decade - entered the United States. The majority came from Eastern and Southern Europe. The reason for their coming typically rested on the push of hardships at home - including a lack of economic opportunity, religious discrimination and political persecution - and the pull of the expectation of a better life in the "Promised Land." 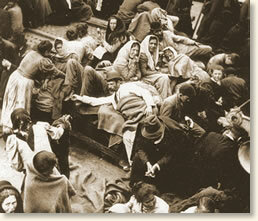 see "Immigration in the Early 20th Century" >>>. Those who could not afford first or second class passage were processed through screening centers such as Ellis Island before being allowed to continue their journey. Although many made their way to the agricultural and mining lands of the West, the majority ended up in the urban centers of the East living in self-segregated enclaves and working at menial jobs and often exploited by their employer. Sadie Frowne was typical of this new wave of immigration. She was thirteen when she arrived in America with her mother. They had left their native Poland after the death of Sadie's father and the failure of the small grocery store that provided them a living. The two made their way to America with the help of Sadie's Aunt Fanny who lived in New York City. Sadie's mother soon died and Sadie was left on her own, first finding a job in what she describes as a "sweatshop" in Manhattan's Garment District and then in the Brownsville section of Brooklyn. Sadie told her story to a journalist just three years after her arrival in America. It was first published as a newspaper article and later with other autobiographies as a book. "We saw the big woman with the big spikes on her head." "We came by steerage on a steamship in a very dark place that smelt dreadfully. There were hundreds of other people packed in with us, men, women and children, and almost all of them were sick. It took us twelve days to cross the sea, and we thought we should die, but at last the voyage was over, and we came up and saw the beautiful bay and the big woman with the spikes on her head and the lamp that is lighted at night in her hand. Aunt Fanny and her husband met us at the gate of this country and were very good to us, and soon I had a place to live out [Sadie is referring to becoming a live-in domestic servant] while my mother got work in a factory making white goods. I was only a little over thirteen years of age and a greenhorn, so I received $9 a month and board and lodging, which I thought was doing well. Mother, who, as I have said, was very clever, made $9 a week on white goods, which means all sorts of underclothing, and is high class work. But mother had a very gay disposition. She liked to go around and see everything, and friends took her about New York at night and she caught a bad cold and coughed and coughed. She really had hasty consumption, but she didn't know it, and I didn't know it, and she tried to keep on working, but it was no use. She had not the strength. Two doctors attended her, but they could do nothing, and at last she died and I was left alone. I had saved money while out at service, but mother's sickness and funeral swept it all away and now I had to begin all over again." "I got a room in the house of some friends who lived near the factory. I pay $1 a week for the room and am allowed to do light housekeeping - that is, cook my meals in it. I get my own breakfast in the morning, just a cup of coffee and a roll, and at noon time I come home to dinner and take a plate of soup and a slice of bread with the lady of the house. My food for a week costs a dollar, just as it did in Allen Street, and I have the rest of my money to do as I like with. I am earning $5.50 a week now [equivalent to approximately $115.00 in today's money] , and will probably get another increase soon. It isn't piecework in our factory, but one is paid by the amount of work done just the same. So it is like piecework. All the hands get different amounts, some as low as $3.50 and some of the men as high as $16 a week. The factory is in the third story of a brick building. It is in a room twenty feet long and fourteen broad. There are fourteen machines in it. I and the daughter of the people with whom I live work two of these machines. The other operators are all men, some young and some old." "Henry has seen me home every night for a long time and makes love to me. He wants me to marry him, but I am not seventeen yet, and I think that is too young. He is only nineteen, so we can wait. I have been to the fortune teller's three or four times, and she always tells me that though I have had such a lot of trouble I am to be very rich and happy. I believe her because she has told me so many things that have come true. So I will keep on working in the factory for a time. Of course it is hard, but I would have to work hard even if I was married. I get up at half-past five o'clock every morning and make myself a cup of coffee on the oil stove. I eat a bit of bread and perhaps some fruit and then go to work. Often I get there soon after six o'clock so as to be in good time, though the factory does not open till seven. I have heard that there is a sort of clock that calls you at the very time you want to get up, but I can't believe that because I don't see how the clock would know. At seven o'clock we all sit down to our machines and the boss brings to each one the pile of work that he or she is to finish during the day, what they call in English their 'stint.' This pile is put down beside the machine and as soon as a skirt is done it is laid on the other side of the machine. Sometimes the work is not all finished by six o'clock and then the one who is behind must work overtime. Sometimes one is finished ahead of time and gets away at four or five o'clock, but generally we are not done till six o'clock. The machines go like mad all day, because the faster you work the more money you get. Sometimes in my haste I get my finger caught and the needle goes right through it. It goes so quick, though, that it does not hurt much. I bind the finger up with a piece of cotton and go on working. We all have accidents like that. Where the needle goes through the nail it makes a sore finger, or where it splinters a bone it does much harm. Sometimes a finger has to come off. Generally, though, one can be cured by a salve. All the time we are working the boss walks about examining the finished garments and making us do them over again if they are not just right. So we have to be careful as well as swift. But I am getting so good at the work that within a year I will be making $7 a week, and then I can save at least $3.50 a week. I have over $200 saved now. For the last two winters I have been going to night school. I have learned reading, writing and arithmetic. I can read quite well in English now and I look at the newspapers every day. I read English books, too, sometimes." Sadie's account appears in: Holt, Hamilton, The Life Stories of Undistinguished Americans as Told by Themselves (1906); Kraut, Alan, The Huddled Masses: The Immigrant in American Society, 1880-1921 (1982); Handlin, Oscar, The Uprooted (1951). "Immigrating to America, 1905," EyeWitness to History, www.eyewitnesstohistory.com (2005).